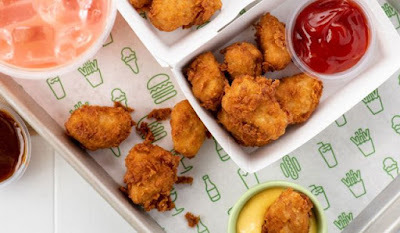 Shake Shack fries up new Chick'n Bites nationwide for a limited time. The chicken nuggets feature cuts of boneless antibiotic-free chicken breast that are hand-breaded and deep-fried to order. You can order Chick'n Bites in 6-piece and 10-piece orders. Available dipping sauces include BBQ Sauce and Honey Mustard (although you can also ask for cheese sauce, Shack Sauce, or buttermilk herb mayo as well). Prices vary by market but you can expect a 6-piece order to cost about $4, while a 10-piece order should be about $6. They were first tested in September 2018 at the chain's Innovation Kitchen and West Village Shack in NYC.